EURUSD grew high as a result of Draghi and Yellen’s speeches and today this pair is chiefly under the influence of the Preliminary GDP data and the ADP data from the US. 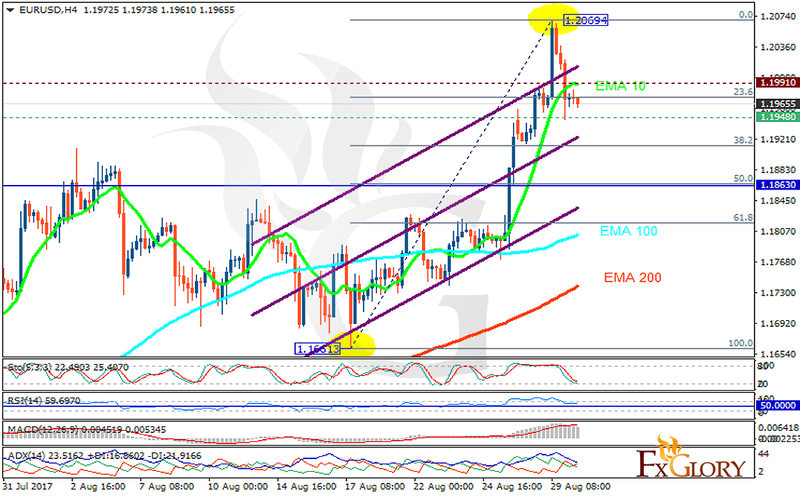 The support rests at 1.19480 with resistance at 1.19910 which both lines are above the weekly pivot point at 1.18630. The EMA of 10 is moving with bullish bias along the ascendant channel and it is above the EMA of 100 and the EMA of 200. The RSI is moving below the overbought area, the Stochastic is moving in low ranges and the MACD indicator is in positive territory. The ADX is showing sell signals. It seems that the correction pattern has just started towards 61.8 level of Fibonacci, otherwise, EURUSD will continue its bullish trend towards 1.25 area.